It can be very handy to have a macro snap a picture. If you have a motion sensor outside your front door and you also have a camera mounted there, then you can create a macro to snap a picture anytime the sensor is tripped. Then you'll have a record of who came to your front door while you were gone. You can also store video clips. Use your imagination and I bet you'll come up with a lot of fun uses for this. Video Source - This is the video source to use when snapping a picture. If you haven't added the video source yet, you can click the Video Setup button to add (or change) a video source. Delay - Sometimes you may want to wait a little bit after a motion sensor is tripped, like when the sensor is a little ways away from the camera. So if this is set to something other than 0, it will wait a bit before snapping the picture or video clip. Snapshots - This will snap a still picture. You also have the option to take multiple pictures a certain interval apart. This gives you some of the advantage of video clips without the large size. 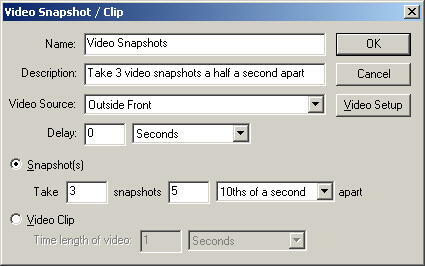 Video Clip - When this is selected, it will record a video clip for the selected duration. The name of the video clip will be determined by the settings for the video source (see Video Setup).